Taking place on Sunday, September 9th, our first Women’s Sportive will take in 80km of North London and Herfordshire. 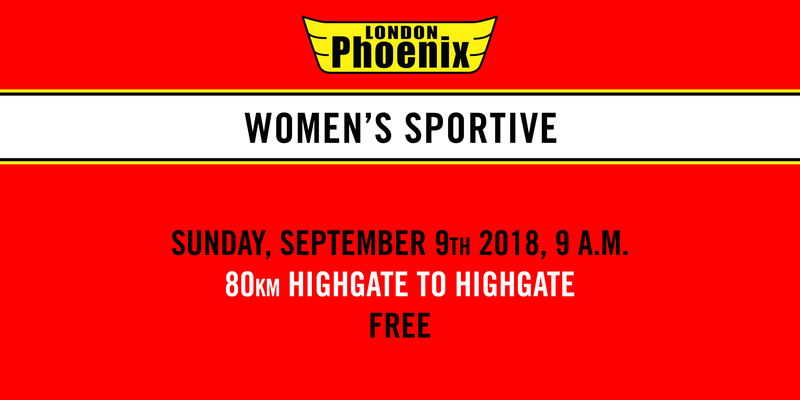 There will be multiple groups of different paces, led by members of London Phoenix and our alumni, with an optional café stop en route and drinks in The Flask pub at the end. The sportive is completely free, just register to your interest on our Eventbrite page. Meet in Pond Square, Highgate for a 9 a.m. departure. Plenty coffee places within a stone's throw distance if you want to come early and have breakfast somewhere. Optional mid-ride coffee & cake stop will be at https://maps.google.com/maps/search/The%20Country%20Bumpkin/@51.8248176574707,-0.15306878089904785,17z?hl=en. Finish back in Highgate at the Flask for another coffee or something to eat or both.